Biblical sites are identified several ways. A few sites have been known for millennial. For example, Jerusalem (earlier Jebus, 1 Chronicles 11:4-5; and Salem, Genesis 14:18), Damascus, Athens, and Rome. Some scholars have identified sites on linguistic grounds. For example, Edward Robinson identified biblical Bethel with Beitin in 1938. This proposal had been generally accepted until David Livingston suggested, in the last few decades, that Bethel should be identified with el- Bireh. Some names have remained virtually unchanged. Modern Anata is thought to be biblical Anathoth (Jeremiah 1:1). I note that the Syrian town of Ribleh is identified with biblical Riblah (2 Kings 25:6). After all these centuries only one letter is different. Other sites are identified on the basis of inscriptions. Such is true of Gezer, Thyatira, and Lystra. This brings me to my topic today. The identification of Lystra was made by J. R. S. Sterrett in 1855 on the basis of a Latin inscription found at the site. The inscription is now displayed at the archaeological museum in Konya (biblical Iconium). Inscription with the name Lystra. Photo by Ferrell Jenkins. 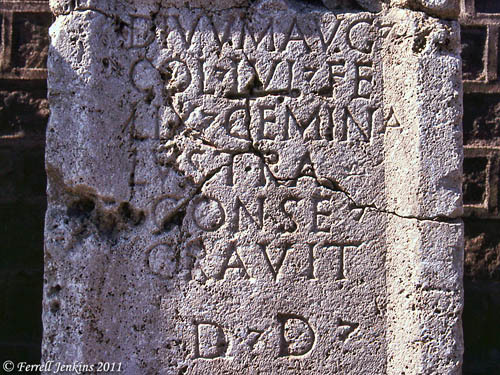 The inscription includes the full Roman name Colonia Iulia Felix Gemina Lustra. See Mark Wilson, Biblical Turkey, 173. We called attention to this inscription, with a photo of the entire stone as it is displayed at Konya more than four years ago, during the first month of this blog, here. The brethren of Lystra and Iconium spoke well of young Timothy at the time Paul chose him to join his preaching party. I have failed to say recently that archaeological mounds (tells) in Turkey are identified by the Turkish word höyük (pronounced who-youk). This entry was posted in Archaeology, Bible Places, blog, New Testament, Photography, Travel, Turkey and tagged Apostle Paul. Bookmark the permalink.